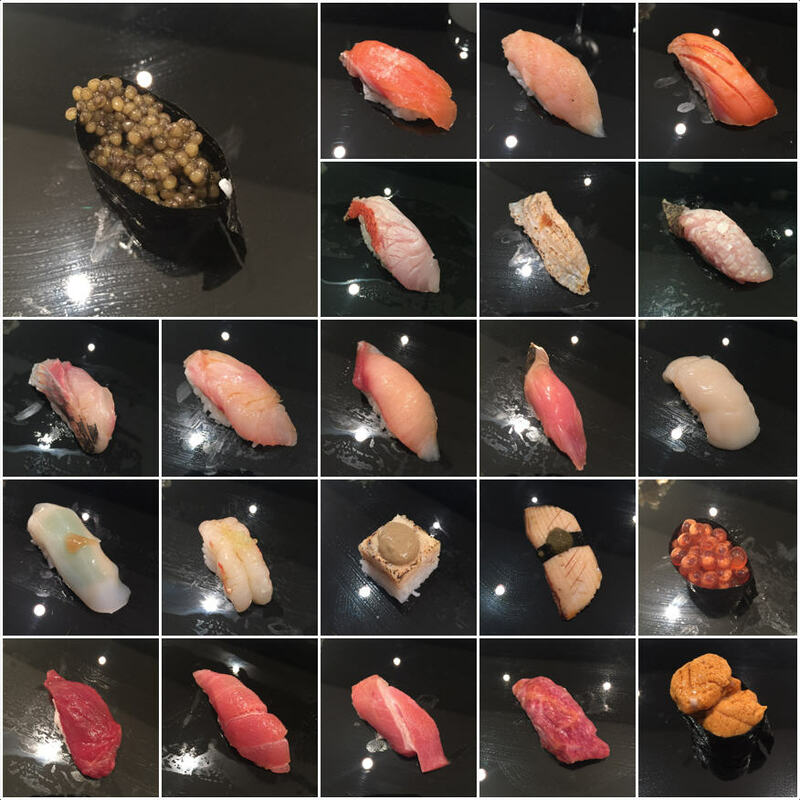 Almost two whole years since our last full omakase, and what a difference. 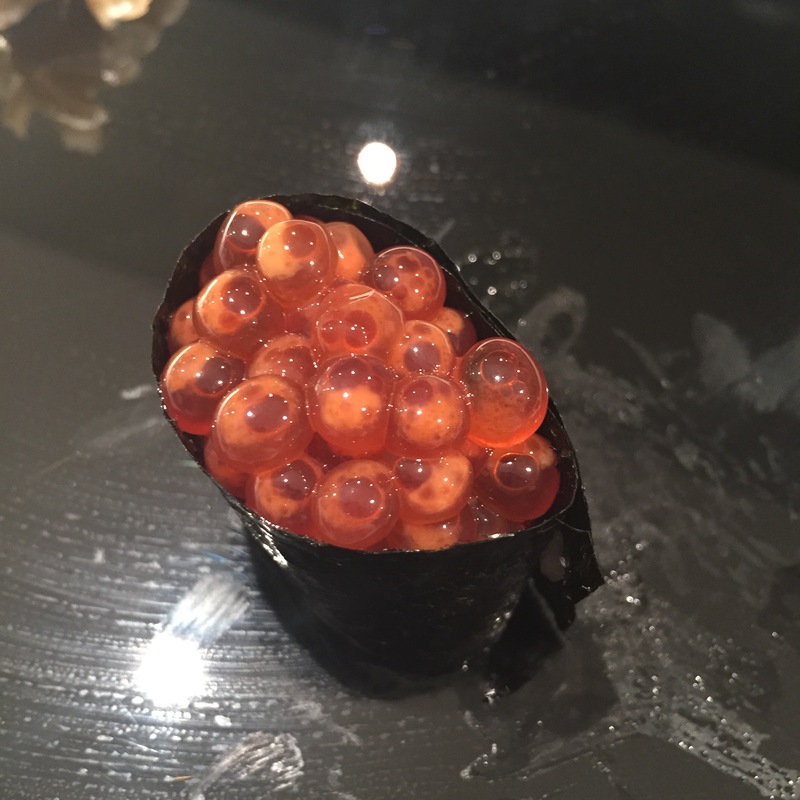 Our first and only other full omakase with Nakazawa-san was great, too many salmons (which is still the case), but everything was fresh, and tons of UNI options. Today, out of 25 servings (omakase is 20 servings, we had 5 add ons), there were 3 greats, 15 goods, 4 mediocres, and 3 downright bads. Meaning, today’s omakase was A LET DOWN. 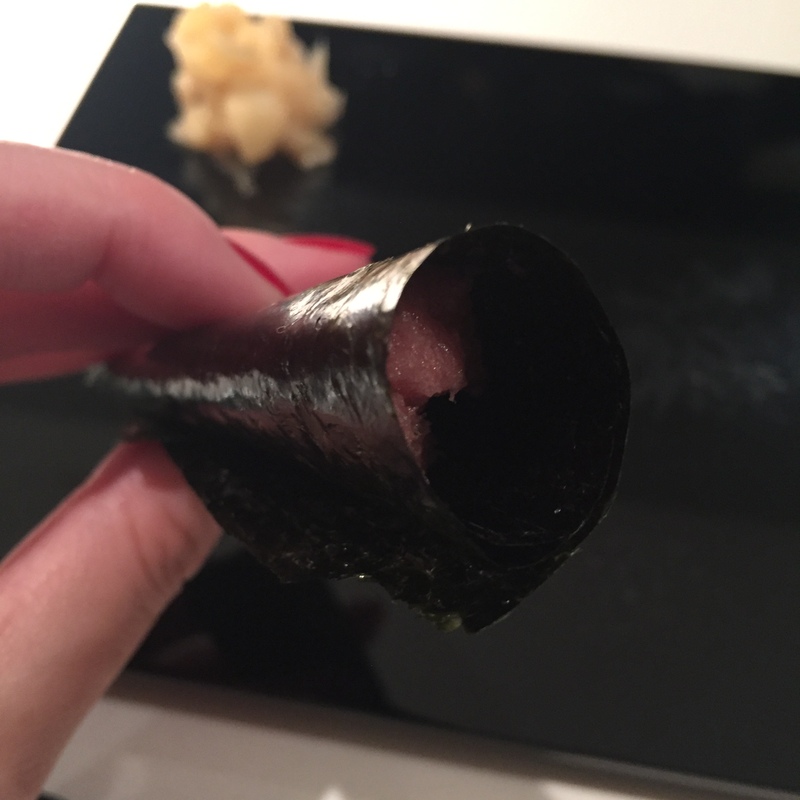 In my opinion, there should be zero tolerance for ANY “bad” servings for super high end sushiyas. And that’s what they’re trying to be right? I had briefly wondered whether it was because Nakazawa-san was hurt. He was in a full sling, thus could not prepare the fish himself. But that should not have stopped him from overseeing the selection, the aging, the preparation, and the tasting of the fish. We were served two skunked UNIs, and one bitter BOTAN EBI. Honestly, if you’re supposed to be a 4 star sushi ya, you should be guaranteeing your customer a certain level of quality. There is no excuse for even one bad serving, and they had THREE. It’s funny, I was chatting with a dear girlfriend of mine, who I call Kitty Kat. Kitty Kat’s new beau was raving to her how Nakazawa was the absolute best sushi restaurant in NYC. Kitty Kat shares that he goes to Tokyo a lot, so he should know what he’s talking about. This frustrated me on so many levels. I’m not saying that this is what Kitty Kat’s new beau was, BUT… People read an article or two and think they know it all. But who wrote that article? What qualifies their opinion? And for folks to think that because you’re from Tokyo, you’re the know-it-all on sushi? Why? I’m not saying that I’m the authority, but I do have a very specific and CONSISTENT way of on how sushi-yas are rated. It ensures the same scale, same measurement basis. Costs aside, a good sushi-ya should mean a decent variety, fresh fish, and well prepared, which includes how well it’s aged as well as how it’s served (cutting, treating, toppings, dressings, etc). I add in costs because to most, cost matters. When I go to a sushi-ya, I’m also always looking for what they do that makes them shine, what are the one, two, three (or more) servings that knocked my socks off, that makes the meal unforgettable, that means I MUST go back. 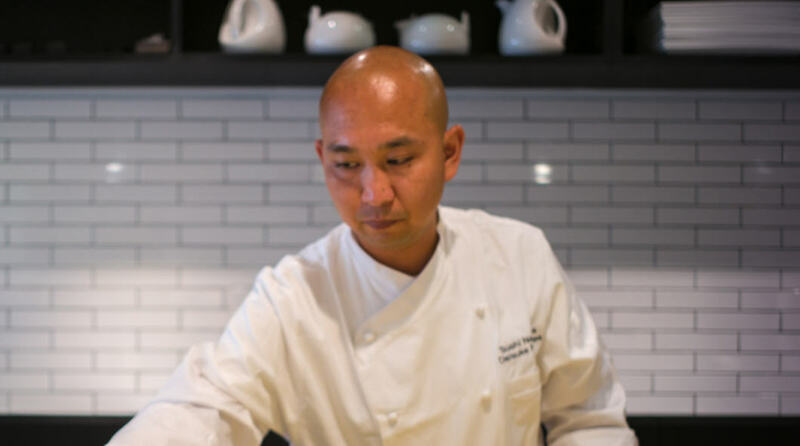 The unfortunate truth is, Nakazawa did not have ANY servings that warranted daydreaming about. And trust me, I WANT to love Nakazawa. $150 for a 20 piece omakase is a VERY good deal, AND we live SO CLOSE, 10-15 min walk max. I WANT to love Nakazawa, but I can’t. That speaks volumes. Oh, and going back to the Tokyo/non Tokyo bit, just because you go to Tokyo a lot, or even if you’re a Tokyo native, that don’t mean didly squat to me. I mean, if you’re from the US, are you a hot dog and cheeseburger expert? If you’ve been reading my posts, you’ll know that I believe high end sushi from NYC kicks high end sushi at Tokyo’s booty. 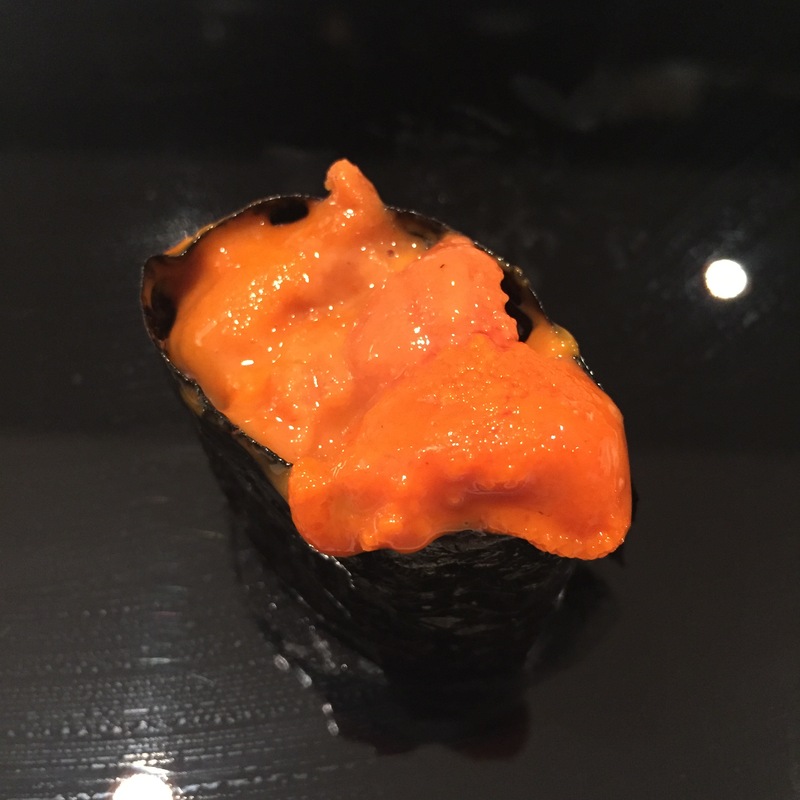 I go into quite a bit of detail about NYC vs Tokyo sushi in my UCHU post, so take a read. Now, if you’re from Sapporo, I might speak a little softer. HAHAHA! 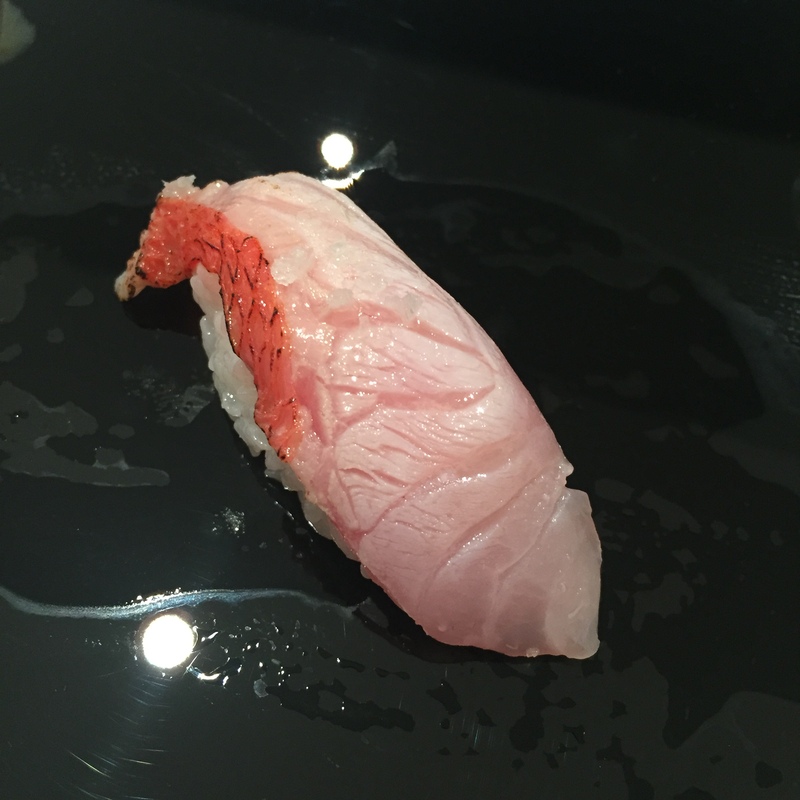 Take a read of my SUSHI MIYAKAWA (Sapporo) post! I’m not obnoxious enough to say that because I’ve had two omakases, I’m fit to give the final word on a restaurant. But I’m also not ignorant enough to think, NY Times says 4 stars, so they must be the best. Give me a break! So let’s have an honest and open discussion. 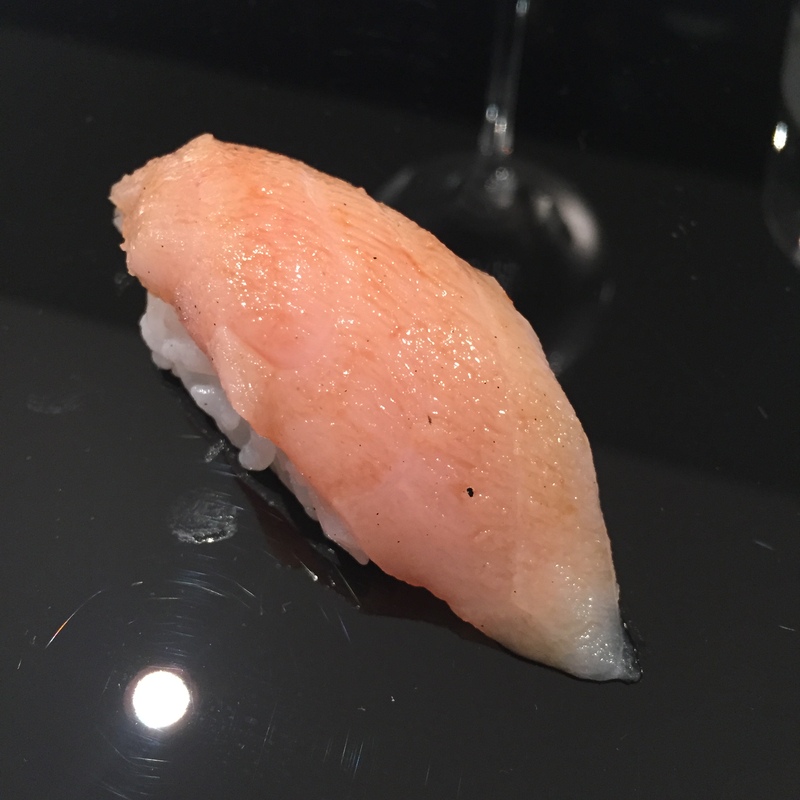 Variety – Nakazawa is right up there with SUSHI YASUDA and KURUMA ZUSHI! Atmosphere and Staff – Incredibly well polished! 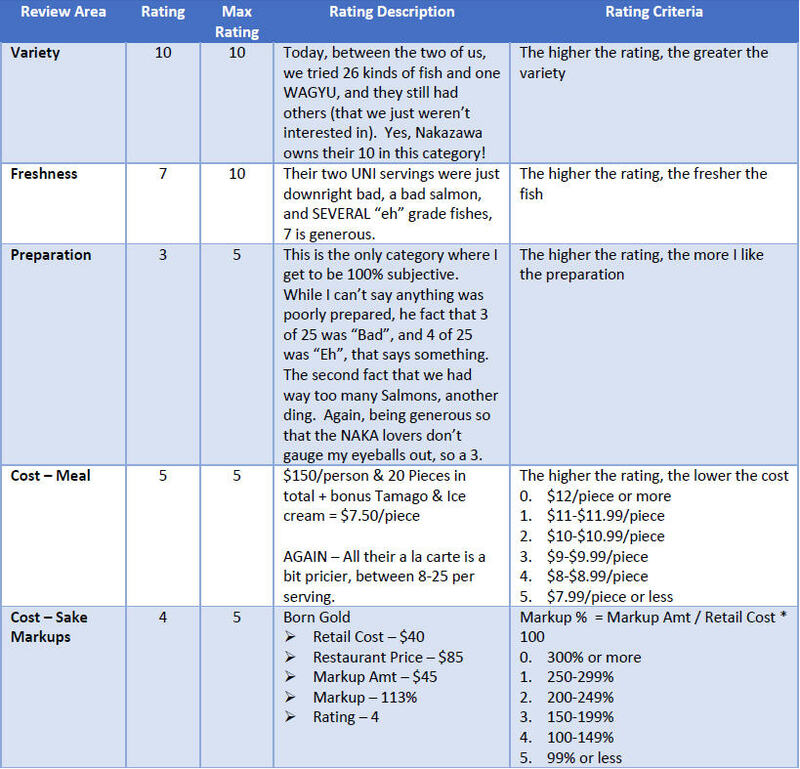 3-4 servings of Salmons – I LOVE a salmon here and there, but not 3-4 in one seating, and not in my omakase. I can get really good salmon for 4 bucks at every corner sushi ya, so don’t go wasting that many of my servings with this! A long time back, the Japanese considered Salmons to be “Garbage” fish in Japan, only fit to be served cooked. These days, you can find salmons at every KAITEN (conveyer belt sushi), and the fish market serving bowls (the DONs, the CHIRASHIs), but you will not find it at the higher end sushi-yas. But maybe this is how they keep costs down? Now I ask… what was NY Times basing their stars on? 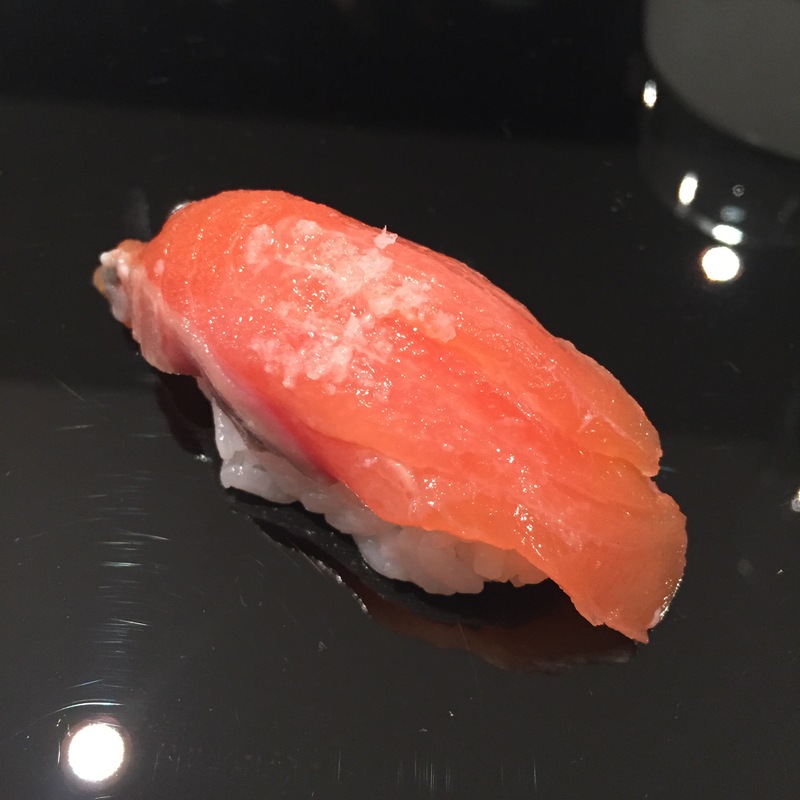 Chum Salmon (Hokkaido) – Topped with sea salt and citrus, this was unusually light, much more muted flavors for the salmons. 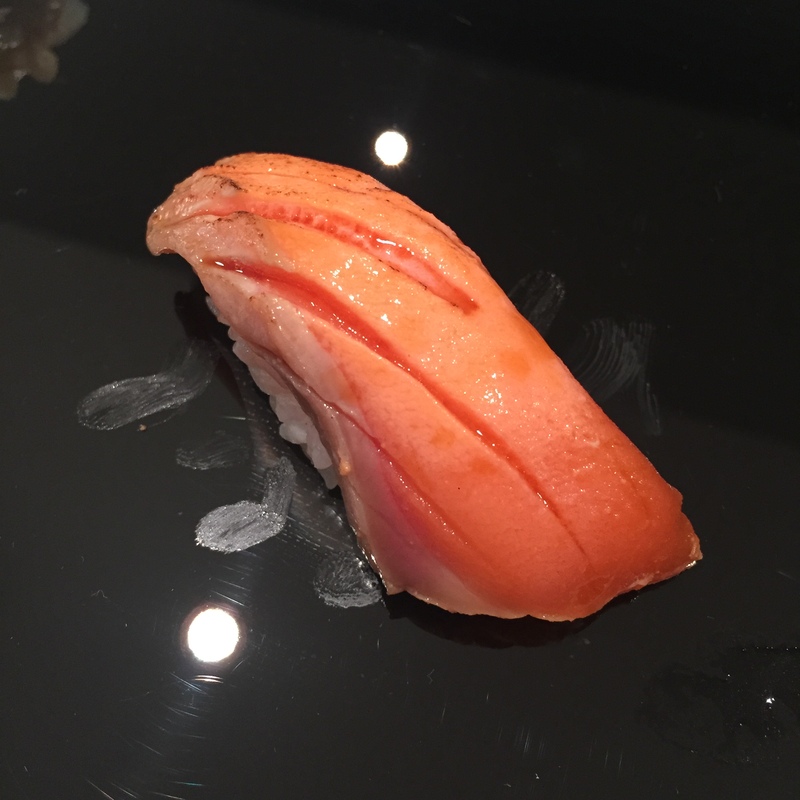 ZUKE SHIRO SAKE (Soy Marinated Chum Salmon) – This was fine, but how boring! You know… there’s a reason why they don’t really serve salmons in Japan. You’ll find it in the Kaitens (conveyor belt sushi yas) or as a Don (set bowl with rice on bottom), but never a traditional sushi ya serving omakase. And please don’t mistaken, I really do enjoy a regular piece of fresh salmon sushi every now and again, I crave it even. I just don’t want it served at my $150 omakase, when I know I can pay $3 bucks for a perfectly respectable serving of it elsewhere. 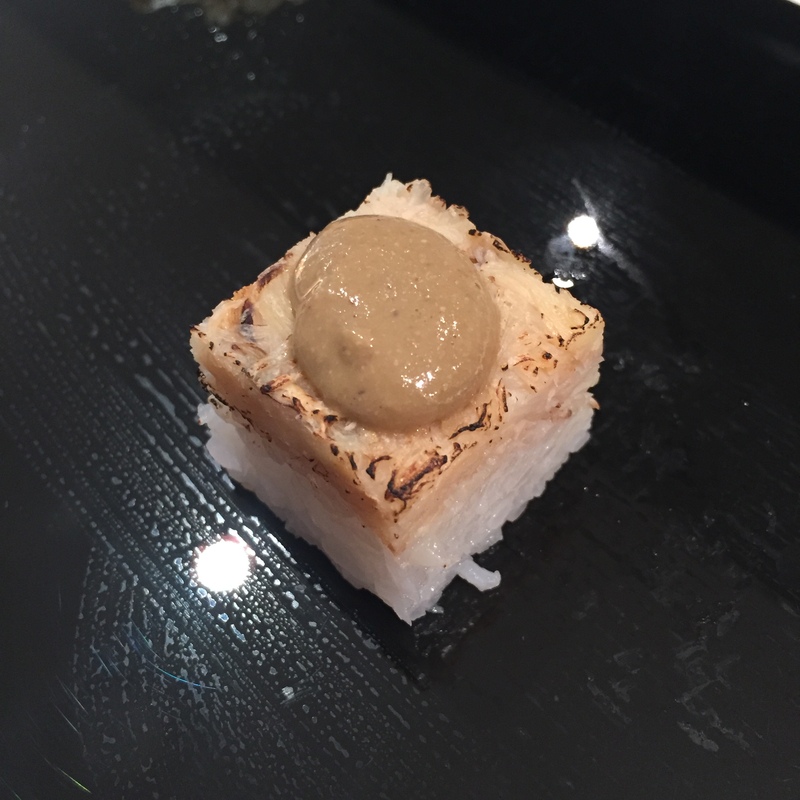 HOTATE (Scallop) – Served with a YUZU KOSHO (Yuzu chili paste), this was a decent serving. Whenever I have a serving topped with a strong something, i.e. chili, I take my fish in two bites. Gasp! Taboo! Well get over it. First bite, I avoid the topping, so I can taste the fish as is, second with, so I can taste the fish as the chef intended it. Fish wise, the HOTATE had zero crunch, zero liveliness. Still “good”, but nothing to write home about. IKA (Squid) – First “really good” serving of the night. 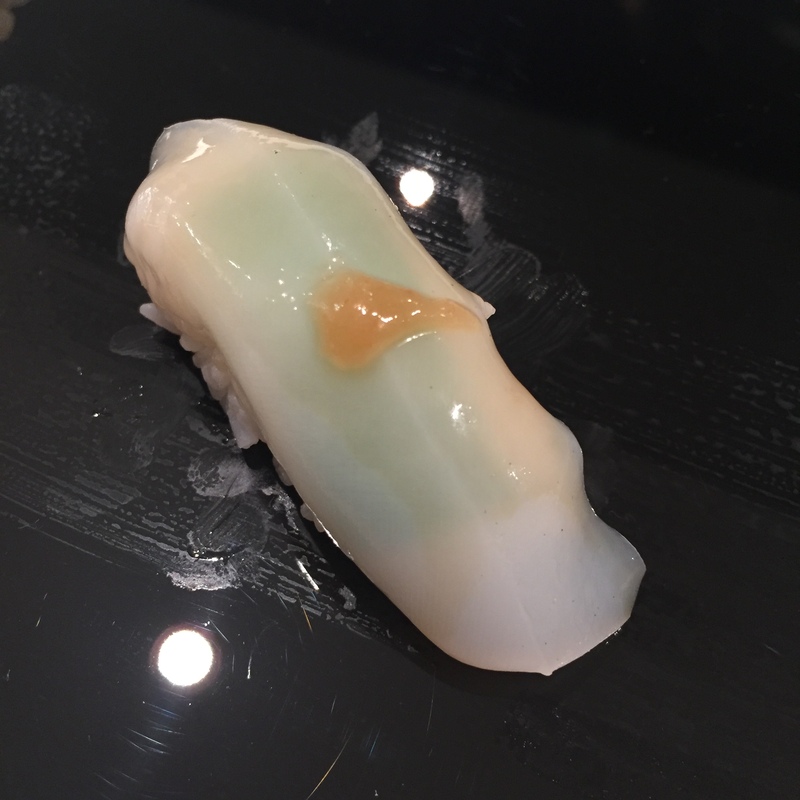 Sorry, I’m extraordinarily stingy with my “greats”, this one didn’t make it to the “great” cut though… This was a nice thick cut of IKA served with UME and SHISHO. Very nice! 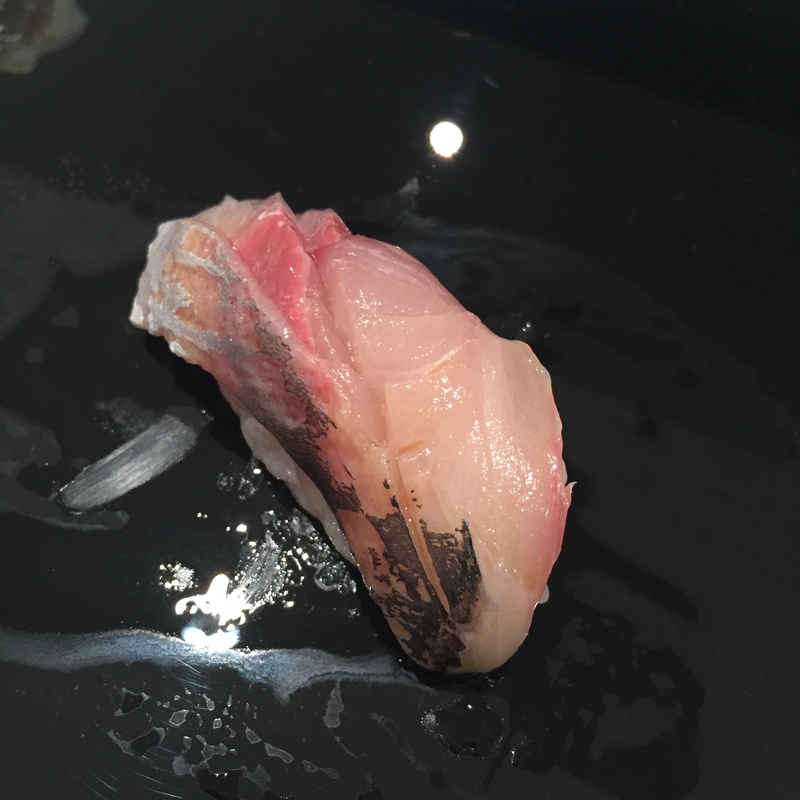 ISAKI (Grunt Fish) – Good streak continues! What a vibrant brightness this ISAKI had. Very, very good! 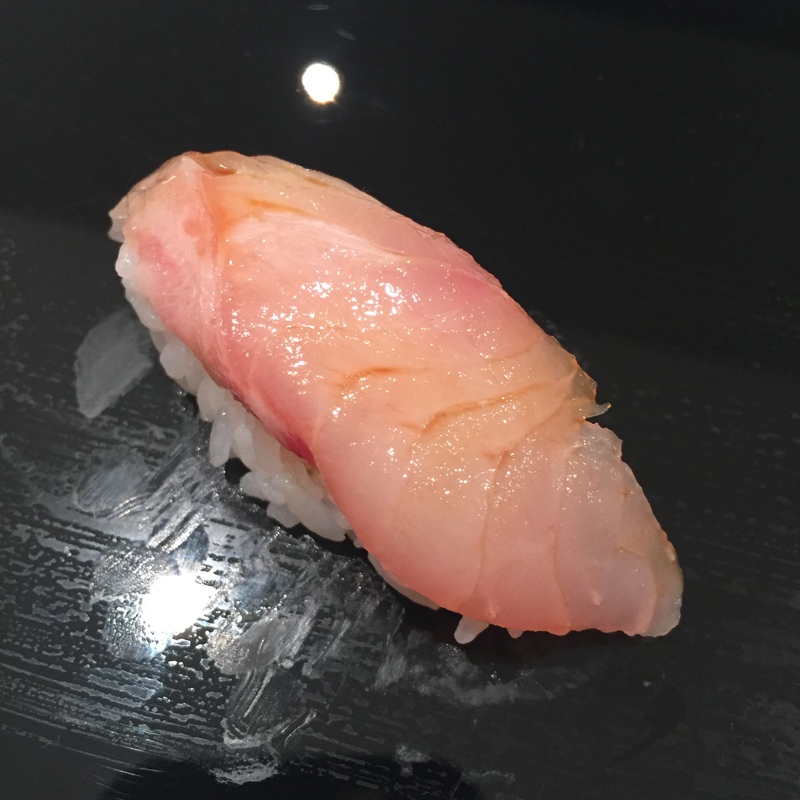 KINMEDAI (Golden Eye Snapper) – Lately, I feel like everyone’s been serving my KINMEDAI with soy rather than sea salt. I’m very glad chef did not do that here. Third really good piece in a row. 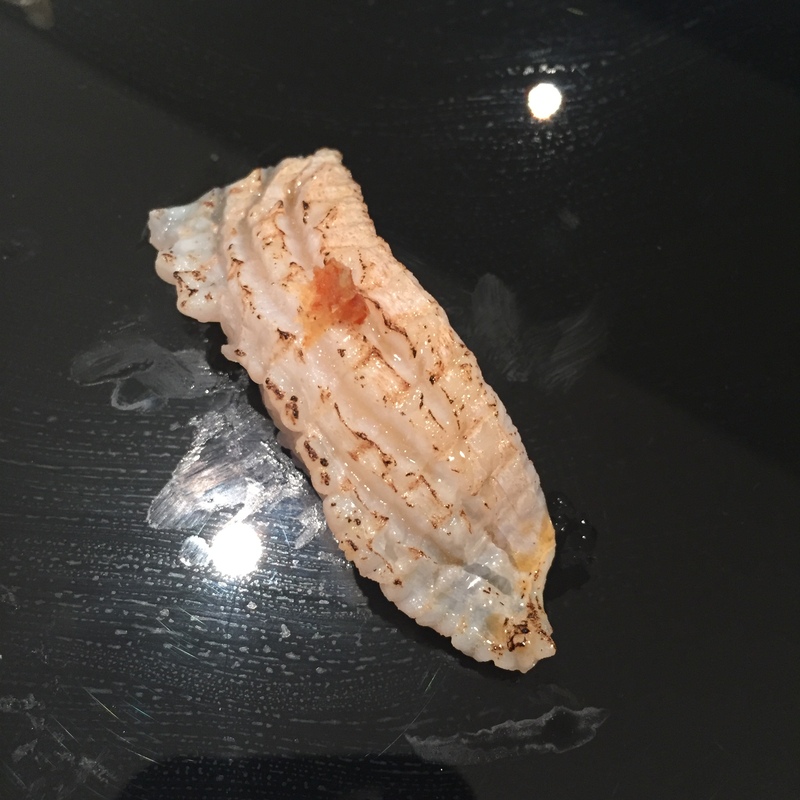 AJI (Japanese Mackerel) – Ever so lovely, but again how boring! Same deal as the salmon, but clearly on a lower scale, I can find this in like 80% of all sushi-yas in NYC, $5-6 and I have a perfectly good cut of AJI. Why would I want that at a sushiya that took me 2 months to book? SAWARA (Spanish Mackerel) – SAWARAs are in a very different category than the Salmons and AJIs. SAWARAs are available in every single sushi-ya in NYC, every single one. How it differs is, unlike Salmon and AJI, only the top sushi-yas will be any good at preparing and serving it. Truly, the SAWARAs at the lower end sushi-yas are not edible. The SAWARAs at the higher end ones, like NAKAZAWA, are quite good, something I would actually seek out and order. Good job! 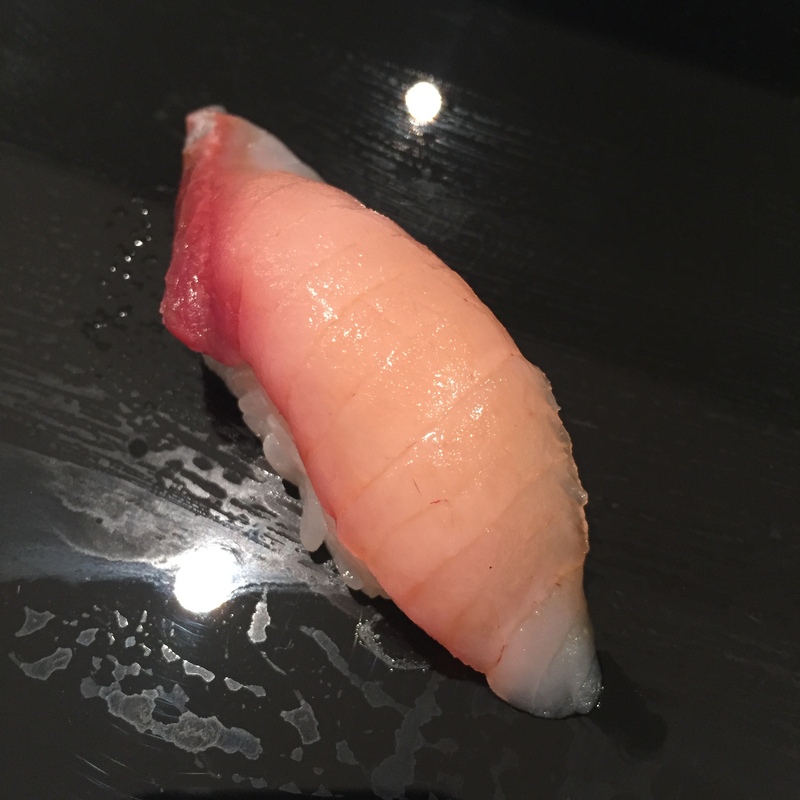 HIRAMASA (Yellowtail Amberjack) – HIRAMASA’s are much harder to find, thus the kind of fish you do want to be served. This one was a great cut, very oily and dense with a crunch to the bite. Very nice! KEGANI (Hairy Crab) – I don’t really get the name here… Chef clearly said KEGANI, which is Hairy Crab, but when presented by the wait staff, she said Dungeness Crab. Odd… That said, this was one TASTY BITE. TINY, but tasty. I don’t get OSHI sushi (pressed square/rectangular sushi) though. It’s a whole lot more effort, for what to me, doesn’t seem to alter the flavor. .. I do wish the bite was larger though. 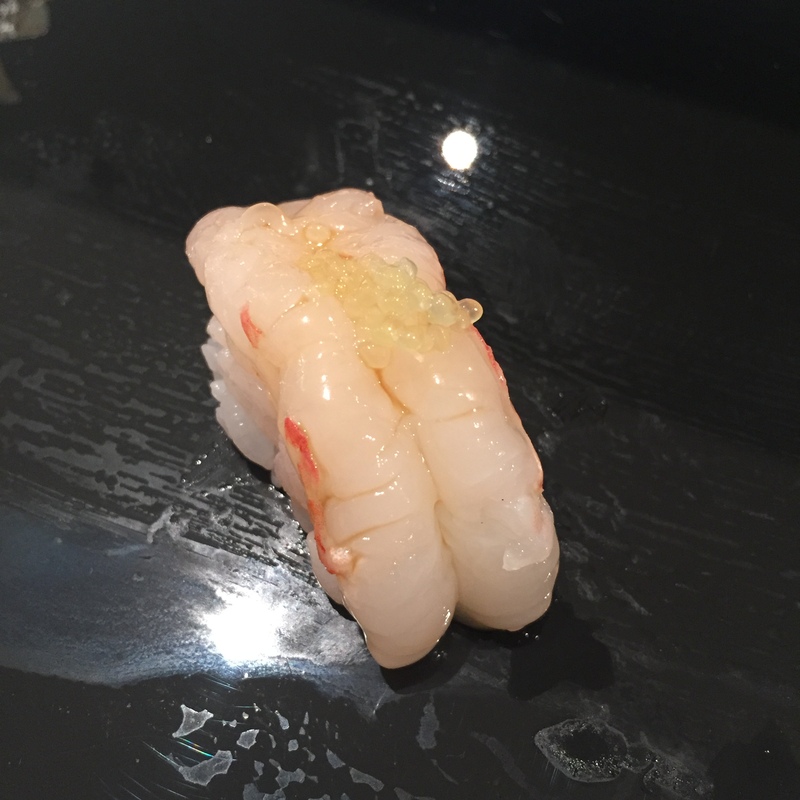 BOTAN EBI (Spotted Sweet Shrimp) – We haven’t been served much BOTAN EBI lately, a lot more AKA EBI, but very little BOTAN EBI. This one had a bite, a bitterness. I can’t say it was any good… How disappointing! SUMA.. (type of Skip Jack) – Chef said “Skipjack”, I said “KATSUO?” He said no, “SUMA-” something. He repeated a couple of times, but I couldn’t hear, and I wasn’t going to keep asking… Either way, this was very, very good! 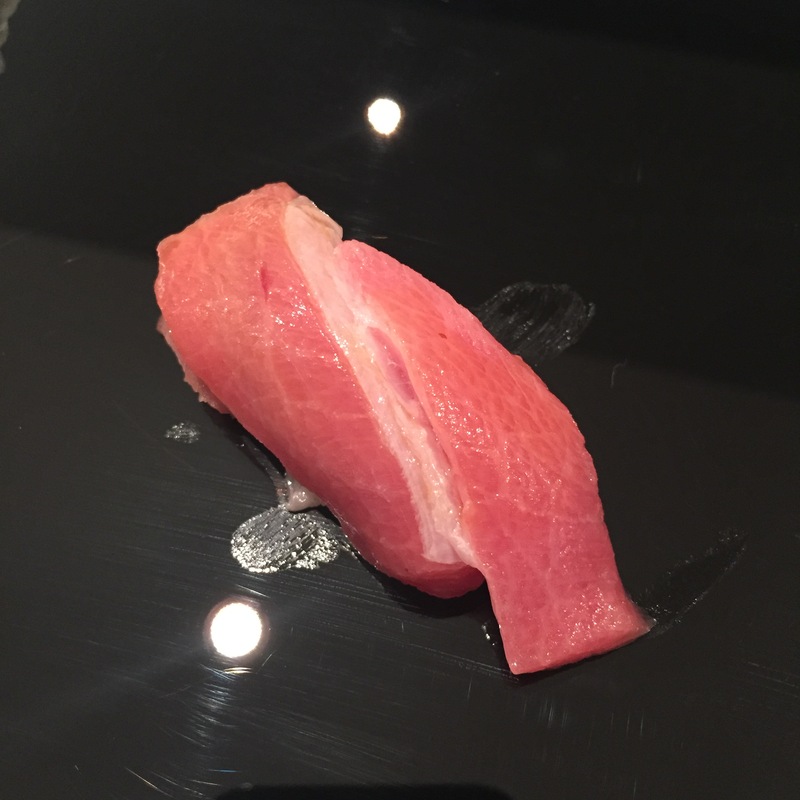 HON MAGURO (lean cut of Tuna) – Not AKAMI, not ZUKE, just HON MAGURO. I don’t get it. It’s a lesser cut of tuna, and it was not very good. Not good at all. I am unimpressed! 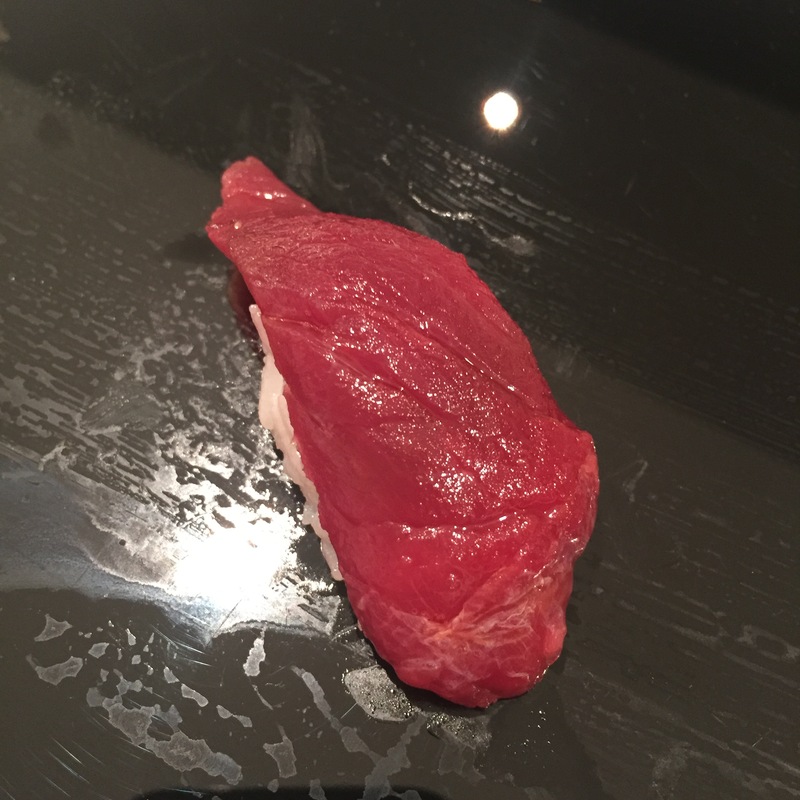 CHUTORO (Medium Fatty Tuna) – This was a decent cut of CHUTORO. That’s a minimum requirement for a higher end sushi-ya though… getting your TOROs right… This was good. 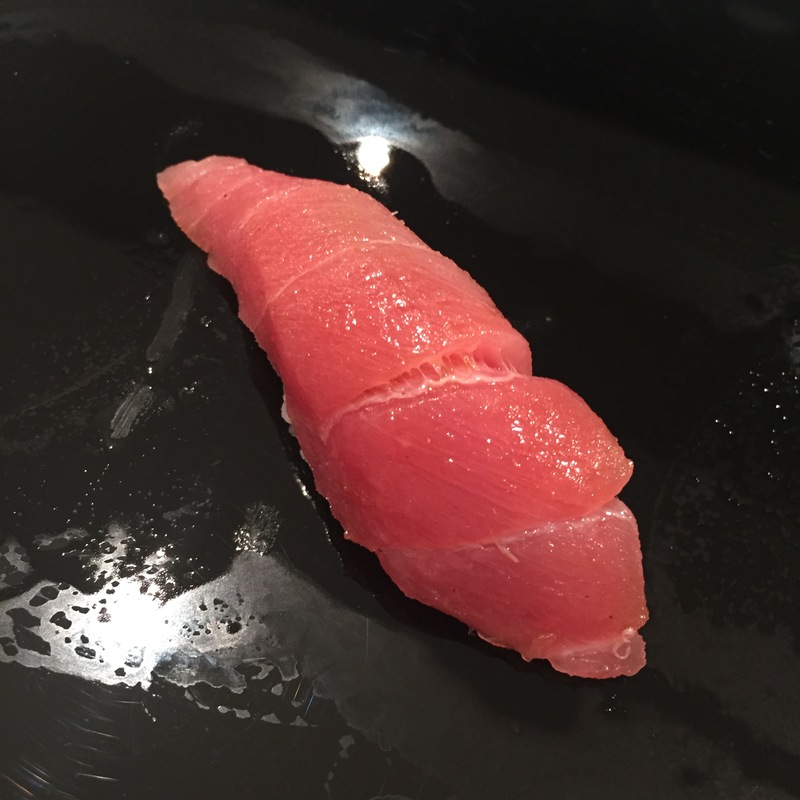 OTORO (Super Fatty Tuna) – This one was better. I’m not a super fatty Tuna kind of gal, but this one was more an in-between of a medium and a super, so down my alley. Only real problem was the big fat vein in the middle, cheeeeeewwwwyy!!! 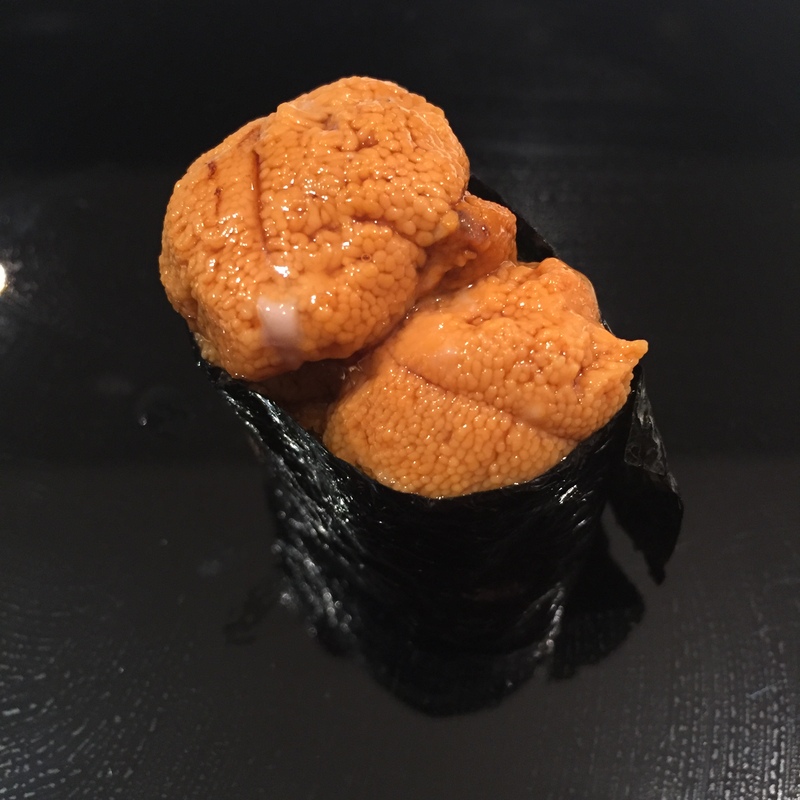 HOKKAIDO UNI – To be honest, other than the first time I’ve had omakase at NAKAZAWA, every time thereafter has been mediocre at best. This one had a nasty bitterness, really low quality. Santa Barbara UNI – 0 for 2. Believe it or not, this was worse than the HOKKAIDO UNI. Had a definitive skunk. First bite was top UNI only and was ok, next bite was remainder of the bite with seaweed, downright SKUNKINESS. 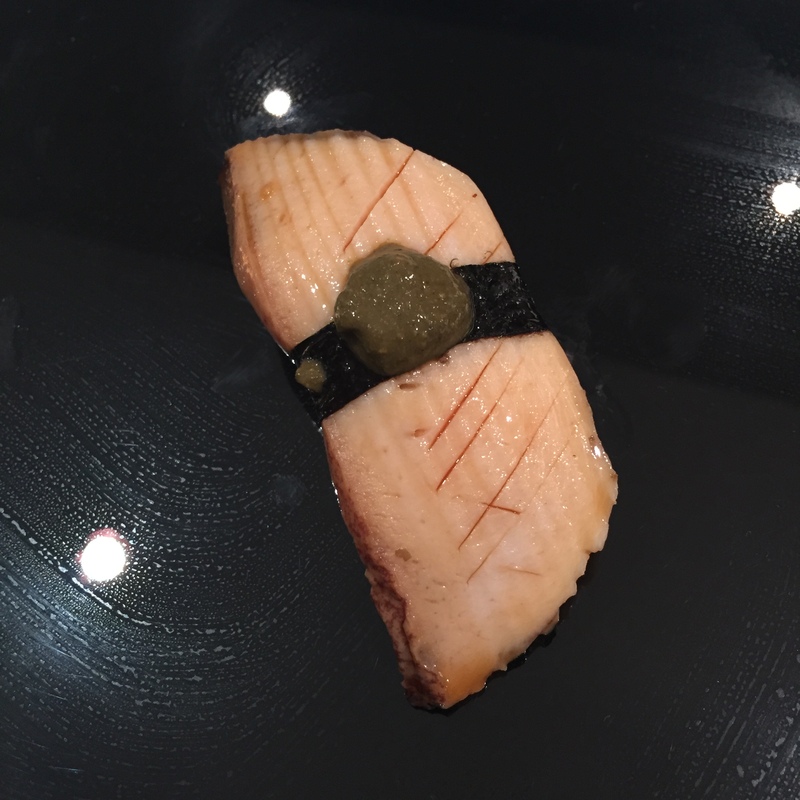 ENGAWA (Fluke fin) – Everyone else got UNAGI, I got ENGAWA, in the words of the great Charlie Sheen, WINNING! I need some Tiger’s blood next. This was a very decent serving of ENGAWA. The right side of it, very tender, perfectly ABURIed (torched), very very good. 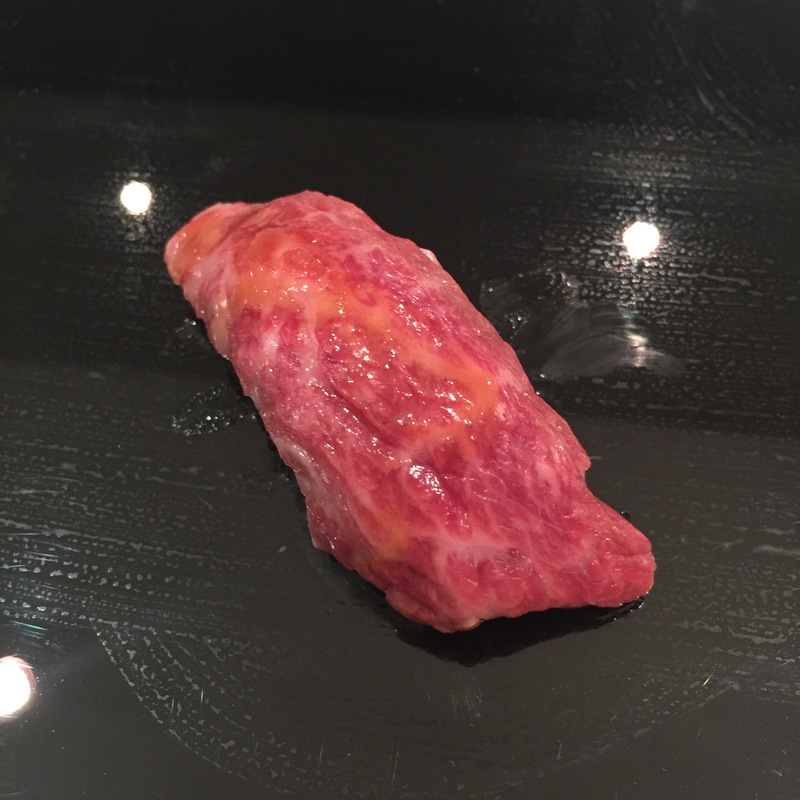 MIYAZAKI WAGYU – In the last couple of years, it seems all high end sushi-yas started serving WAGYU as part of, or an add-on, to their omakases. I gotta say, I don’t hate it. And if they’re willing to give it to me raw, not at all torched, I LIKE IT. I like it a lot. This was definitely a melt in your mout cut. Very rich and buttery. First “Great” peice of the night. 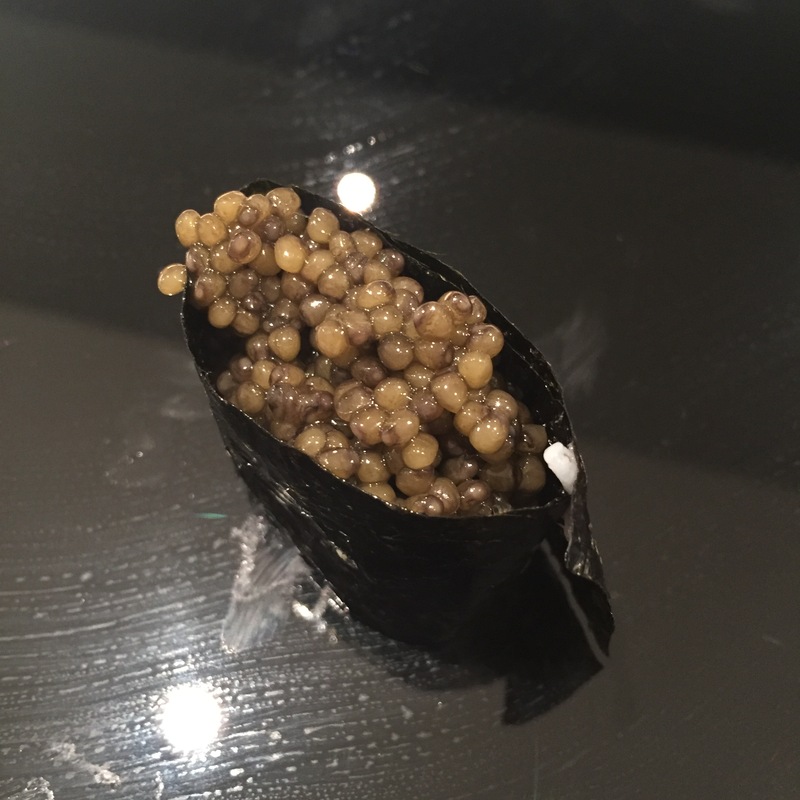 Ossetra Caviar – Another trend that’s been picking up in the recent year, two at most. Most NYC chefs that’s picked up on this trend incorporates the Caviar into their sushi serving as a topper. A few serves it solo. To be honest, if served solo, I’d rather have it just on my belini with a little creme fraiche. The Ossetra alone was fantastic but at 35 bucks a serving, it better be! KUROMUTSU (Black Gnomefish) – This one was SRUMPTIOUS! Third “Great” of the night. This white kicked all the other whites booty served tonight. 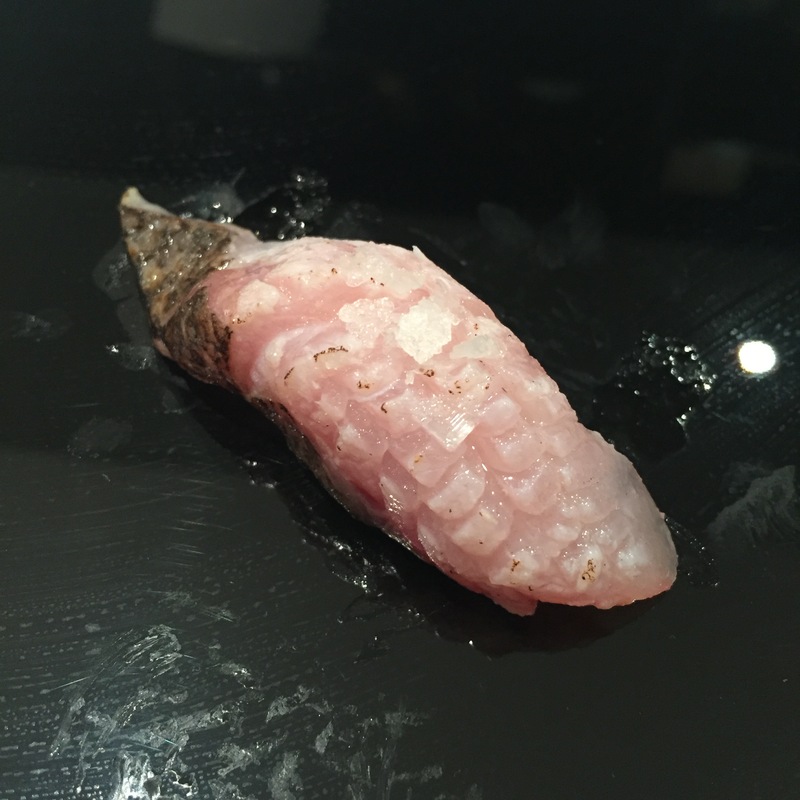 KUROMUTSUs are a fancy, pricey fish, and very hard to come by in NYC. Not because of the price, as we all know New Yorkers are willing to pony up for their fish, but really because it’s a less common fish, and an UGLY one at that. Served with the skin nicely ABURIed (torched), and topped with Sea Salt, I have zero complaints. Really, really incredible.